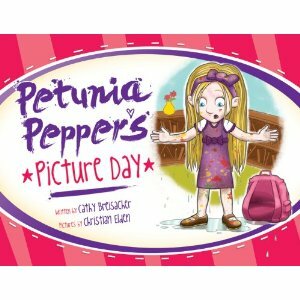 Petunia Pepper's Picture Day is a morally engaging story about how outside appearances are not that important. Petunia is determined that this years school pictures are going to be perfect! Every school picture she has taken to date, has been marred in some way, according to Petunia. From the powder puffy hair to her puffy pink eye, Petunia just hasn't had much luck in taking a good picture. On the morning of the big day, Petunia is dressed, primped and preemed and feeling good about herself but when the syrup dribbles on her lap at breakfast and she misses her school bus, you just know that Petunia's day is not going as she had hoped. A couple adventures later and Petunia arrives at school completely in a mess and cannot get her photo taken at all. Heartbroken, Petunia sits and wathces as her class take their photos. However, the next day, Petunia is in the newspaper and she becomes the "star" of the hour. I loved the bright, colourful and cartoony-like illustrations in the book. The moral message that you are who you are, is evident as you read. This is a delightful, value-building book to read to your youngsters . There are many phonetically sounding aspects of the book, like the frequent use of the letter P, as well as, biblical scriptures to back up the message that the book is trying to convey! Poor Petunia Pepper! Every year disaster strikes her on school picture day. Puffy hair, pumpkin-style smiles and pink eye help create pictures that only her family could love. But this year, Petunia promises herself things are going to change. She plans carefully for the perfect picture day. Unfortunately, she misses the school bus and begins a series of misadventures that lead to yet another picture day fiasco.